In this third installment of our summer series about enjoying in-season organic produce, learn simple tips for highlighting rhubarb! How can you go wrong with a fresh summer produce item that’s nicknamed “the pie plant”? Just like the leaves of its lemony-tart botanical cousin, garden sorrel, the ruby-red and emerald-green stalks of rhubarb are also mouth-puckeringly sour, but this “fruit” also contains a remarkably luscious and unique essence that has lent its flavor to pies, crumbles, cakes, fools and cobblers for generations. How to prepare it: Select firm, newly harvested stalks. Only the leaf stems or petioles of rhubarb are edible. Cut away the tip of each stalk an inch or two below the leaf end. Take a fresh slice off the bottom end of the stalk and wash clean in cold water. Cut the stalk up into ½- to 1-inch pieces and simply add the uncooked pieces to pies, cake batters and crisps as you would any other fruit. Alternatively, stew 1 cup of rhubarb with about 2 tablespoons of water and 1 cup of sugar until the pieces are tender and just falling apart. Use as jam on toast and scones, or as a sauce on ice cream, custards and puddings. Spices and herbs to complement: Spices that are commonly used to flavor stewed fruits work well with tangy rhubarb: cinnamon, ginger, allspice, nutmeg, lemon and orange peel. 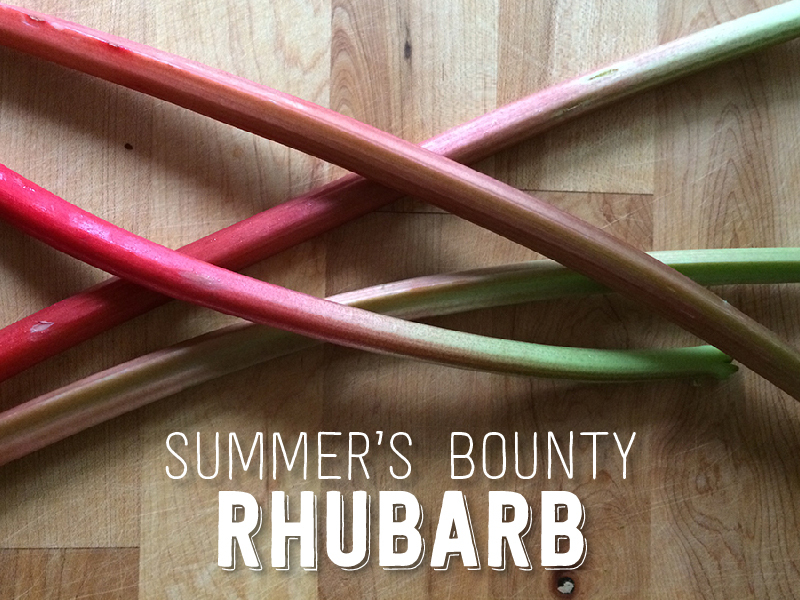 Pairs well with: The classic pairing for rhubarb is with fresh strawberries in strawberry-rhubarb pie or jam. Each greatly improves the flavor of the other. Additionally, the dense, silky texture and sweetness of classic vanilla pastry cream or egg-based custards are perfect foils for the mouth-puckering tartness of rhubarb. Go light on the liquid when cooking rhubarb — the succulent stems already contain a lot of water. Preserve fresh rhubarb for off-season use: cube, then freeze on a cookie sheet and store in a freezer bag. Juice it! Sweeten the strained juice of fresh rhubarb stems to taste and use as an unusual cocktail or punch mixer. Trim rhubarb stalks into sticks and use as a garnish/stir stick for summertime drinks and cocktails. Go savory. Add a bit of rhubarb to fruit and vegetable chutneys to adorn grilled pork or chicken. What are your favorite rhubarb recipes? This entry was posted in In the kitchen and tagged Summer's Bounty by Cayenne Room. Bookmark the permalink. An outstanding share! I have just forwarded this onto a coworker who has been doing a little research on this. But yeah, thanks for spending the time to discuss this topic here on your blog. That’s great! Thanks for sharing your kind words with us. We’re glad you found it helpful.